NG Biomed is currently in the late stages of being approved as a Licensed Producer of Medical cannabis for the Canadian marketplace. Please enlighten us with some background on the company? Before the Cannabis Act wave broke, NG BioMed submitted a license application to Health Canada. In 2014, these things were still on paper, carefully printed and prayed over as they entered the postal stream to Ottowa. We worked hard to meet the requirements for a Medical License at our property in the British Columbia hinterlands. We polished our security and production model, with a great team in the pipeline. Eventually we received confirmation that our application was being processed. The whole legal system of Medical and Recreational was being overhauled leading up to 2018, and we had to be ready when the Cannabis Act came in. NGB waited patiently, and worked hard towards setting up our foundations with funding, connections, research, and relationships with the municipality. Along the way NGB purchased Rosebud Productions – a company who had an application with Health Canada but lacked the resources to endure the wait for approval. It was an opportunity to secure another strategic foothold, as it would make NGB the only licensed medical grow in a municipality servicing the whole Vancouver region. 2019 has been very busy: NGB hit some big milestones with its Rosebud facility and license. Joining forces with Cocos Pure Beverage Corp has been a massive achievement and a welcome source of revenue while we wait to make our stake in the legal market. 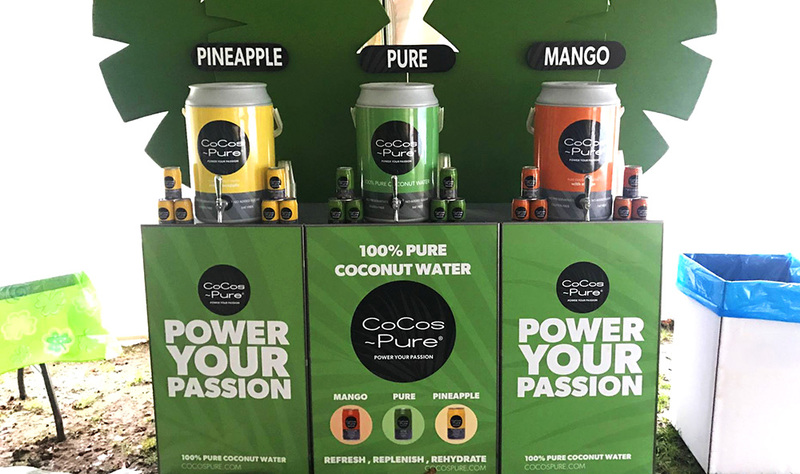 Cocos Pure is a multi-national coconut beverage and topical manufacturer. How will the new vertical fit in with your current business model moving forward? By October 2019 The Cannabis Act in Canada will include a new class for edibles, topicals, and extracts: Cocos Pure is an established company with experience, prestige, and a robust brand identity that many Canadians already know and trust. This sets us up to add CBD and THC infused products to an existing line, allowing NGB to transition into the market and connecting a huge part of our user base to the smoke-free medicine that they have been waiting so long for. With our existing product line we have regular retail sales and are expanding global distribution ahead of regulations in Canada allowing CBD. Regular retail chains can become familiar with the brand prior to any hybrid health and wellness products being introduced. Beverages are the company focus, but coconut plays into so many other aspects of the health and wellness segment, and the lifestyle CBD brand works alongside medical cannabis. NGB can leverage the existing global distribution of Cocos Pure, which helps our plan to become a global supplier of cannabis infused products. CBD is very much on the tip of everyone’s tongue nowadays, and Cocos Pure would seem to be a perfect fit for this integration with product lines. Any plans to integrate CBD lines into your offerings? Coconut is such a fantastic and diverse material. It has so many incarnations – fiber, food, fuel. Its culinary profile and its efficacy as a carrier oil make it the perfect candidate for CBD integrations. We are excited to continue developing our product line to explore the possibilities of this. Can you imagine the relief of a cool, not-too-sweet coconut water at the peak of your pain? It’s so easy to digest, and very stable as a carrier. It really is a perfect combination of two plants known for being over-achievers. The news is currently full of stories regarding Medical cannabis shortages in Canada. Theoretically, any new player coming to market has success written all over the venture. How are the current demands for Medical cannabis in Canada and for new players entering the space? Canada went through a big shift in attitude towards cannabis in the last few years, and leading up to the end of prohibition, the ‘grey-area’ pot industry proliferated. For the most part authorities were looking the other way: everyone knew the law was about to change. It was a booming industry. But now that the law is set, we are seeing a lot of fall-out – the system is very backlogged with processing license applications. When the Cannabis Act passed, Health Canada created an online tracking and licensing system. Any activity in the industry – medical, recreational or hemp – has to go through the same online portal. NGB and Rosebud applications had to be resubmitted – they called it “migrating a paper application” – but it really meant a huge overhaul to meet the new national mandates. We worked hard and we kept our place in the queue. A lot of other applicants haven’t been as lucky – it’s hard to hold out with these kinds of administration delays, so now the market is open but it doesn’t have enough legitimate supply to keep up with the distribution precedents set by the black market. So, for players like us, who have invested so much into planning and cultivating our relationship within our community, the opportunities are starting to abound. But for those old-school growers, the generational gap is very wide, and many businesses are struggling to cross it. Europe has over 700 million people, and medical cannabis has started to creep into a lot of European Countries slowly. Where do you see opportunities for companies like NG Biomed to tap into this very lucrative market? NGB is already in discussions with strong European companies that share similar values, in regards to CBD, medical cannabis, and downstream products and brands. Distribution is a key point for many of these conversations; we are exploring JV opportunities, and sales and licensing agreements. In fact, Cocos Pure beverages are already for sale in 5 European countries, 4 of which are CBD legal. The opportunity to expand our distribution footprint in Europe is tremendous, and we foresee substantial growth in the near future. NG will be attending the upcoming Spannabis conference this month (March) in Barcelona, Spain, holding meetings with our current importers and distributors and looking to expand our future footprint for both traditional retail, and for hybrid CBD products and medical cannabis products for export, in the near future. The company has donated 1 million dollars to UBC (University of British Colombia) to study the effects of Medical cannabis on people with HIV/AIDS. What is the current status of this study? Far lower levels of HIV virus in the blood of people who recently acquired the infection – if they were using cannabis at least once a day. Better engagement in medical care for opioid use disorder – if people starting methadone reported using cannabis frequently. Among people with chronic pain, lower rates of illicit opioid use – if they are using cannabis. Thanks to our support, Dr. Milloy is currently planning a number of clinical trials to see if the preliminary benefits they’ve observed above can be replicated in experimental procedures by providing cannabis to people with these chronic conditions. Would you outline the long term vision for NG Biomed? I want to keep this short, which is hard with so much brewing for NGB and Cocos Pure. We want to be a global company, with facilities capable of servicing trade standards set by international mandates. We aim to produce hybrid health and lifestyle products, and be capable of meeting a medical grade for export, with relationships abroad to import certified ingredients. Prospects are flourishing as the nations of the world open their medicine cabinets to one another, and we will keep pioneering our way through the red tape towards creating a healthy, safe, sustainable for-profit community. Benjamin Patock – Boveda Inc.
Kary Radestock – CEO Hippo Premium Packaging.